Despite belonging to two different classes within the animal kingdom, frogs (Class: Amphibia) and humans (Class: Mammalia) share similar anatomies and systems. Humans can't live out their childhoods under water like frogs can but our basic needs and bodily functions are comparable. Although each may look quite different, frogs and humans have skin, bones, muscles and organs. The head of both frogs and humans contains the brain, mouth, eyes, ears and nose. Frogs possess teeth and a tongue, like humans, but their teeth are weak and function to hold prey rather than chew it. The chest and abdomen of frogs and humans house the other major organs, while the limbs of both enable locomotion. Frogs and humans share the same basic organs. Both have lungs, kidneys, a stomach, a heart, a brain, a liver, a spleen, a small intestine and a large intestine, a pancreas, a gall bladder, a urinary bladder and a ureter. Males and females of each species have testes and ovaries respectively. On the whole, their organ structure is similar, but frogs have considerably less complex anatomies. They do not have ribs or a diaphragm. Frogs and humans have similar systems, including nervous, circulatory, digestive and respiratory. Both are classified as vertebrates, with a spine and nerves that spread across the body. 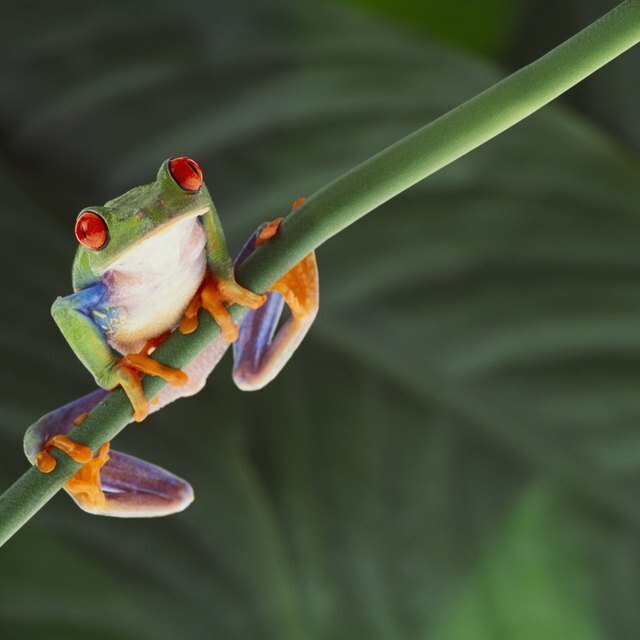 Both frogs and humans have very developed senses of hearing, managed by the nervous system. However, frogs can only detect high-pitched sounds with their ears; they detect low-pitched sounds through their skin. Both frogs and humans also have well-developed senses of sight and smell. Both creatures possess a circulatory system, which operates as the heart pumps blood throughout the body. However, frogs have a three-chambered heart, with two atria and one ventricle compared to the human's two atria and two ventricles. Additionally, frogs and humans have similar digestive and respiratory systems. Although frogs, as adults, inhale and exhale through the mouth only (while humans inhale and exhale through the mouth and nose), the internal organs involved in the respiratory process function in much the same way. Farley, Audrey. "Similarities of Frogs & Humans." Sciencing, https://sciencing.com/similarities-frogs-humans-8531808.html. 13 March 2018.